The guys at tyremen for a number of years now have been supplying genuine alloy wheels at giveaway prices, but how are they able to offer such a good deal on OE wheels, we ask them the questions we think need to be asked. 1. Where do the wheels come from? The wheels we offer, in the past have always come from Holland we have a great working relationship with one of Europe’s largest vehicle importers, although we still get the majority of our OE stock from Holland we have recently taken a large quantity of Nissan Juke and Qashqai alloy wheels from a main dealer here in Hull. 2. But why are these wheels taken of brand new cars, are they damaged? We are asked this question repeatedly. Say you have walked into an Audi showroom and fall in love with an Audi A5, but this car is fitted with standard 17” wheels you ask for bigger flasher wheels, the 17” wheels are removed and replaced. Because the wheel have had tyres fitted to them, they cannot be sold as brand new and this is where we come in. The wheels may carry some very minor cosmetic damage for example surface scratches/chips to the paint but no bends cracks or anything along them lines. 3. What are your main manufacture you stock for? We started with a very small amount of 16” BMW and Audi A4 wheels, then quickly realised that customers really did prefer to buy the OE option for winter use. We now we keep the following. 4. What is your most popular package you sell over winter? Well this is a hard one to answer, there would be three top sellers Audi A3, Audi A5 and the BMW 3 Series 16” option. 5. What is the average cost of just wheels and wheels and winter tyres? Very cheap! The 16” option cost £350 for genuine alloy wheels. The 17” genuine alloy wheels cost £400. 17” wheels and winter tyres cost around £900 delivered, 16” wheels and winter tyres cost around £650 delivered. 6. With the wheel been suitable for the newer vehicles, will these be suitable to take TPMS? Yes, these wheels can be fitted with TPMS sensor valves. We can supply new preprogramed TPMS sensor valve for most new vehicles out there. Thanks winter tyre reviews and Tyremen. Many customers give us a call asking the above question; we are all about advice and love the one on one conversation with the customer, always offering the best package we believe to be suited to them. My first response to this question would be have you considered changing your wheels to a smaller size, to which the customer will respond I don’t really want to spend that much on wheels and tyres just for winter. Therefore, through the process we go. 2nd the cheaper and more affective option. Recommend dropping down to 19” wheels and tyres option and removing the run-flat tyres, sounds strange I understand however, this should become clearer in a line or two. 19” wheels specially designed for use on the BMW X5 & X6 why so special you ask, when you remove the 315/35R20 from the rear and were to fit a normal 19” or even a 20” it would look sunken under the large wheel arches this is due to the width of the wheel and the offset. What we use is a narrower option both wheels are 9” x 19” offset front ET48 & offset rear ET18. BMW would use this same fitment on the X6 models Xdrive 30d & Xdrive 35i with there 19” option and it looks great. The tyres size for the X6 & X5 would become 255/50R19 again same spec as BMW. This option is 100% better then the wider 315 tyre size for cutting through the snow and slush. The best part of this is the price. The continental Kit is there so there is no need for run-flats this option many customers take. So there we have it fitting new wheels and tyres really can save you 100’s of pounds. In recent years Jaguar cars have gone from laughing stock, to stock in trade. Sold worldwide and now with the reliability it so richly deserves. With multiple performance models and even an all wheel drive version, there isn’t much wrong with this car. As such, it has a variety of wheel and tyre sizes, making the right choice of winter tyre a big task. Well, the team at Winter Tyre Reviews have been looking at what you can get to keep those powerful rear wheels stuck firmly to the road. From 17″ to 20″ and most likely bigger to come, there are so many combinations, with large rear tyres and smaller fronts, some models the same all round and everything in between. So how has your XF performed during the winter months? Some owners have reported that it’s actually fine, whilst others have found it to be somewhat lively at the rear and winter driving near on impossible. So what can you do and why should you do it? There are two options open to you, and those are change your summer tyres for winters on the Jaguar wheels or opt for a winter wheels and tyres package. If you decide to go for just tyres then in the 17″ and 18″ size, there are plenty of options and with fitting, it’s around £800 a set. A great option and you just rotate the tyres. However, if you are running 19″ and 20″, then things start to become a little more difficult. There are limited supplies of tyres in these sizes and the manufactures now realise that changing wheels and tyres for a smaller size is the best way forward. The reason for this is that having a narrower tyre in contact with the road makes for more grip, better steering and handling is improved. With the larger summer tyres, particularly those on the rear wheels, they struggle to maintain stability in ice, snow, slush and the wet conditions of winter. Low profile summer tyres are great for dry warm days and they make the car feel as though its on rails, but in the winter, not so good. The tread patterns on winter tyre are slightly wider making the evacuation of snow and water quick. In seven seconds, a winter tyre will disperse a bucket full which means the chances of aquaplaning a reduced. The sipes cut into the tread can be up to a thousand or more against an average of 120 on summer tyres, further increasing grip and ensuring that progress is made under acceleration. So what are the options? Well, if you run 19″ and 20″ then for winter you should ideally drop down to 17″ and 18″ respectively. This will put 235/55R17 and 245/45R18 tyres all round and for 17″ it is around £950 and 18″ £1200 a set. 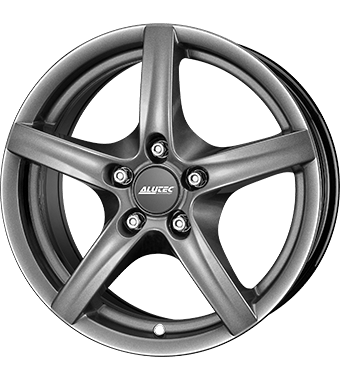 But you also want a wheel that looks good, after all, you’re not going to put a steel wheel on just for winter, sets come with three options, and we think this one below from Alutec suit the XF perfectly. If you would like any further information, then contact the guys at Tyremen on 08456 807808. 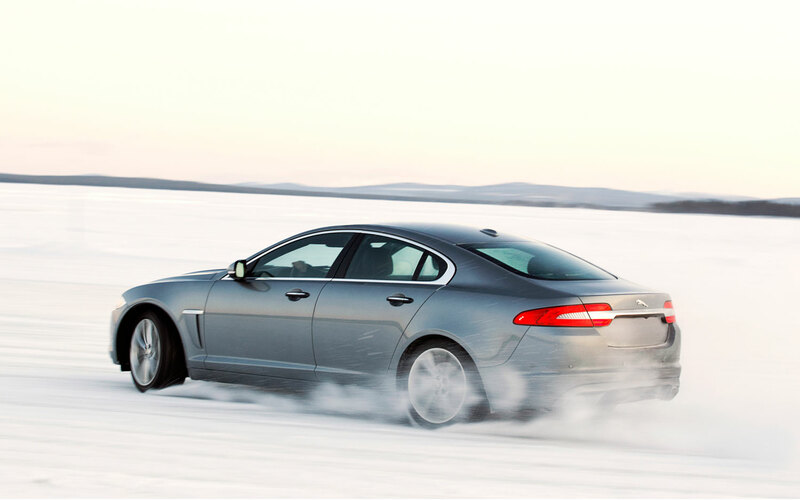 Have you already had winter tyres on your XF? Please leave a comment telling us which tyres you’ve used and how they performed or just leave a question. Here at Winter Tyre Reviews, we’ve covered very specific vehicles in our posts and shown you packages for them. But what if you don’t, like most of us, driver the top of the range SUV, 4X4 or executive saloon car? 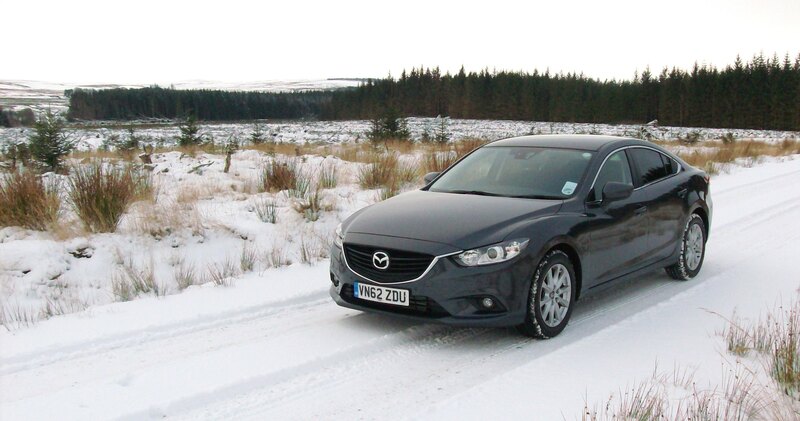 Take the Mazda 6 above, a superb family saloon and a popular choice with many motorists, but would you really fit winter tyres and why would you? So what are the benefits of having winter tyres? Well the answer applies to just about every car on the road, if you know your tyre size, then there is most likely a winter tyre to suit your budget and your car. So what’s the difference between winter and summer tyres? After all, you’ve done ok up to now. That’s right, apart from that time when you put your foot down and the drive wheels spin, front or rear, and that light on the dashboard that show’s a car sliding flickers away. Or the time when you hit the brakes in the car park at your local supermarket and the car goes sideways, the ABS kicks back on the brake pedal because it won’t grip or won’t turn properly into the parking bay. The myth around winter tyres is that you need to have snow on the ground for them to work and that’s why certain places in Europe they are a legal requirement. This is just not true. Summer tyres have a rubber compound that makes them harder at temperatures below 7C meaning that grip on the road, the ability to steer confidently and the handling are seriously reduced. The traditional tread patterns for summer tyres are designed for grip but they often don’t have the capabilities to evacuate water as well in winter conditions, dry use is their main function and they do this superbly. So how are winter tyres different? Winter tyres have a specific tread pattern, like the tyre pictured below, with slightly wider grooves between the rubber and sipes in the tread to effectively grip the road surface. 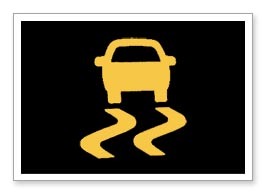 The rubber compound is more flexible below 7C so that it flex’s and moves to the road surface and conditions. An average winter tyre can evacuate a full bucket of water from the tread in 7 seconds, and during wet conditions, this reduces the risk of aquaplaning. Steering comes back to the feel of summer driving, providing that you don’t think you’re Stirling Moss! Snow and slush are pushed from the tread to keep the tyre clear and doing what it’s supposed to do, maintaining contact with the road. The Autocar magazine conducted a test showing summer versus winter tyres and you can see what they found here. For us, it’s a given, the team here run them in winter and we love them and how safe we feel when driving around, but that’s our view, and that’s what we’re here to do. Advice from ours and your experiences. So, if you drive a Toyota Yaris, Range Rover or anything in between, the benefits are there for all cars, vans, motorhomes and campervans. Want more information or would you like to leave a review/comment? Please do. Or you can contact our partner, Tyremen, on 08456 807808 and they’ll be happy to advise you. In the last of our Land Rover vehicle posts, with our partner, Tyremen, we’re going to look at the baby of the family, the Freelander. As with other posts, it’s full of Land Rover heritage, and the 4WD is second to none on a vehicle like this. So why does it need winter tyres? A 4WD vehicle is great, lots of grip, go anywhere attitude and is perfect to keep your family safe. But, as some of you will already know, put it in a field with lots of mud or on a country winter road, and it will slide around on those summer tyres. Why? The rubber compound on summer tyres isn’t flexible enough in colder weather, quite to opposite, it turns harder and won’t give as much grip, affects traction and acceleration and can seriously affect handling, more so if you’re towing a large trailer. Winter tyres are designed with a more flexible rubber compound that moves and grips at 7C and below. Sipes in the tread patterns give great traction on snow, slush and icy roads and water is pushed out with the ability to clear a bucket full of water in a matter of seconds, reducing the risk of aquaplaning. The Freelander comes in wheel sizes from 16″ to 20″, so there is a lot of winter tyres out there for most wheels. The 16″, 17″ and 18″ are perfect for a straight swap for tyres only and with a set of four starting around £520 it’s not an expensive option. If you’re running on 19″ and 20″ wheels, this then becomes a little more difficult. Winter tyres are not made in as large quantities and can be difficult to come by, and starting at over £1000 for a set of four in the 20″ size, it starts to become a lot more expensive. Coupled with the £80 per time to have them changed over twice a year, then you’re into serious money. So what are the options for the larger sizes? Most will opt for a wheel and tyre package and drop down an inch or two. We are firm believers in 19″ dropping to 17″ and 20″ to 18″ wheels for the simple reason that the less tread you put on the road, the better the qualities of the tyre. Big, wide summer tyres struggle in the winter, they can’t cope with the cold. So unless you have big mud tyres fitted, then you should seriously look at winter tyres. The packages come fitted with either the Vredestein Wintrac 4 Xtreme or the Quatrac 3 SUV tyres which are very popular in Europe and great tyres! 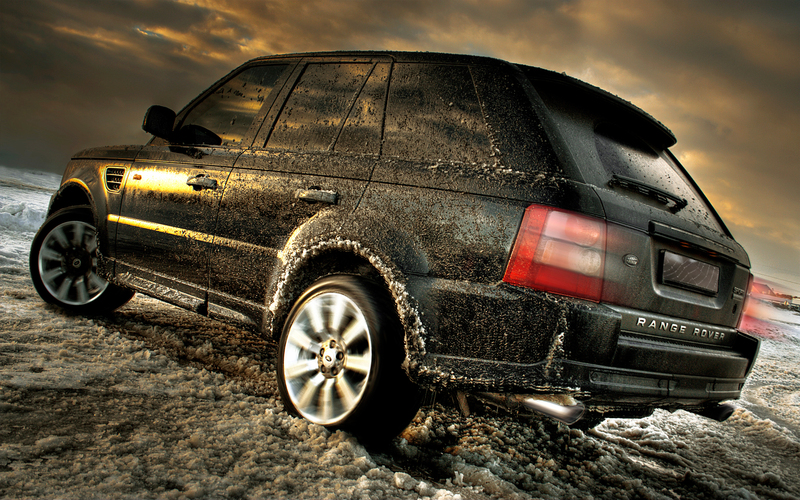 Have you fitted winter tyres to your Freelander? What are your thoughts on winter tyres for 4X4 and SUV’s? Let us know below. Do you have a comment or review? Let us know below! Range Rover, Big, 4WD, Luxury, Winter Tyres? The Range Rover, the vehicle that started the luxury 4WD market. With our partner, Tyremen, we discuss just why it needs winter tyres. New to the market in 1970, it was the first luxury off-roader and has led the way ever since, the car all the others want to be like. 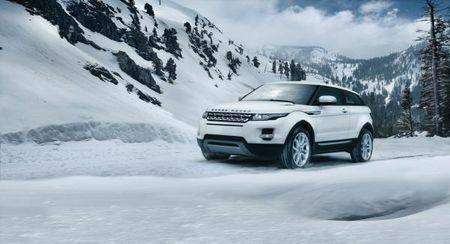 Comes with the superb Land Rover 4X4 system, so why are we even talking about winter tyres? Surely, it can go anywhere, anytime and just laughs at other 4X4’s? Well, in the old days, yes, it came with big chunky off road tyres, perfect for that shooting trip, or taking a couple of hay bales into fields. But now, well, it’s more refined, more day to day usable, more, dare we say, Chelsea tractor? But we love it, it’s what a luxury 4X4 should be! So this is why we are talking about winter tyres, low profile summer tyres just don’t do a Range Rover any justice in winter conditions. With original wheels sizes between 19″ and 22″ these huge tyres are great in the warmer months, but, they struggle to be flexible and give enough grip when it gets cold. So what are the options? You can change the existing summer tyres for winters, have them fitted to the very nice Range Rover wheels and store the summer tyres. There are a couple if issues with this, as the wheels come in several sizes, there are tyres for the smaller wheels, but when you hit the 20″ and upwards, they become very difficult to get hold of, and in some cases, non-existent. If you have 22″ wheels, then you may as well forget tyres in that size, few available and prices start around £400 each. The reason for this is that the tyre companies have realised that narrower tyres makes for a better winter performance, so they look to winter packages and drop down to 19″ wheels and tyres. So what real difference will winter tyres make, we don’t exactly get covered in snow for weeks at a time? Winter tyres are not just for snow, they perform so much better in colder weather, under 7C, because the rubber compound is flexible in the cold, the tread patterns, like the Vredestein below, and the sipes within the tread grip the road and improve steering, handling and shorten stopping distances compared to summer tyres. After all, at two and a half tonnes, it takes some grip to keep it going where you point it. Winter tyres are designed to remove water, slush and snow from the tread quickly, and the Vredestein Wintrac Xtreme S do just that, and when fitted to the classic looking Zito Blazer 5 spoke wheel, sets the Range Rover off perfectly. So, for safety, when you have that most precious of cargo’s on board, your family, it seems to be the only way forward. If you want more information, talk to the guys at Tyremen on 08456 807808 and see what they can do for you. Packages start at a shade over £1100 and other wheels can be sourced, it certainly makes it worth while thinking about for winter driving safety. 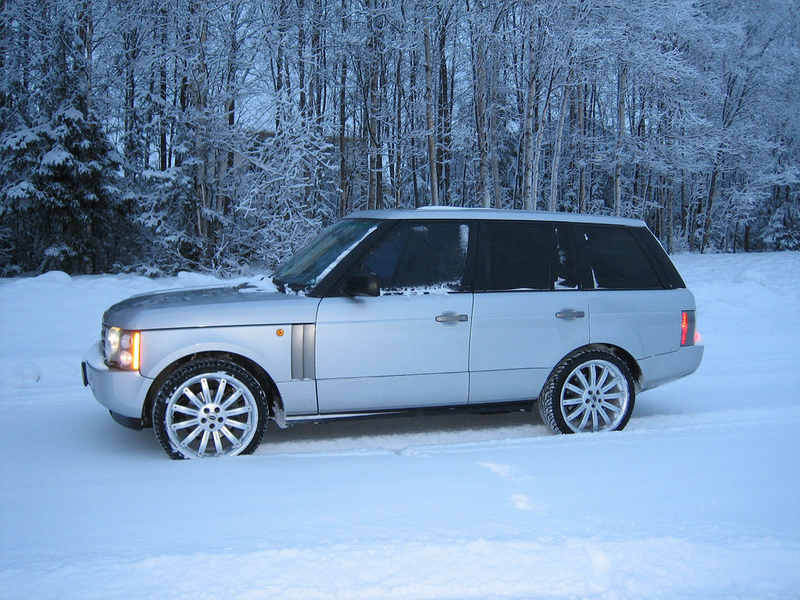 Have you fitted winter tyres to your Range Rover before? Leave a comment for others and give us your thoughts, did they work? Was it worth it? Another of our vehicle specific posts, this time, with our partner Tyremen, the Range Rover Evoque and a look at winter tyre packages. launched in September 2011, this car has proved to be a massive hit and rivals the BMW X5 and the Audi Q5, and frankly, could well be the best of the three given it’s Land Rover heritage. With a wide range of wheel sizes from 17″ to 20″ so we’ll start with 17″ and 18″. Coming on standard summer tyres, with a reasonable profile, they perform great in warm, dry sunny days (when we get them). Normally, we would always recommend dropping down an inch or two, but with these, they are already a good size just to fit winter tyres straight to your current wheels. The 225/65R17 Wintrac 4 Xtreme winter tyre by Vredestein starts at a reasonable £140 per corner delivered. The 235/60R18 a shade over £120 per corner delivered. 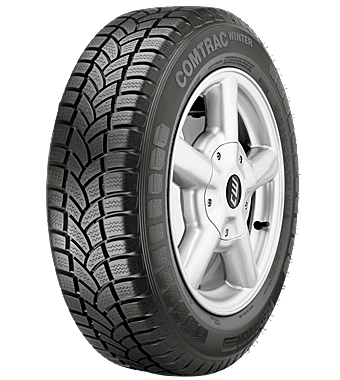 The tyre has great properities, a directional tread pattern which is ideal for clearing snow, slush, and more importantly, water for when that thaw comes. 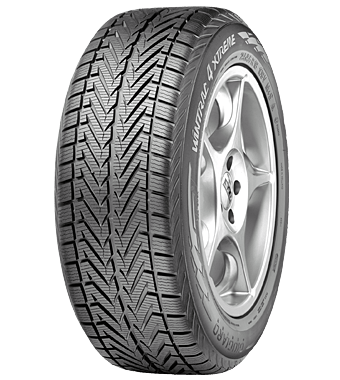 The design specific sipes in the tread, grip the road with the assuredness of a summer tyre giving a positive feel for steering and handling, essential in winter conditions, even on icy roads. The rubber compound is a lot more flexible in colder weather, further increasing the grip on a heavy car. Now we’ll take a look at the options for 19″ and 20″ wheels. There are two options in this size, you can buy winter tyres to fit to your current wheels, as with the 17″ and 18″ or you can drop down to an 18″ winter wheels and tyres package. Winter tyres in the 19″ size are readily available during the winter months, and prices start at £140 per tyre delivered. 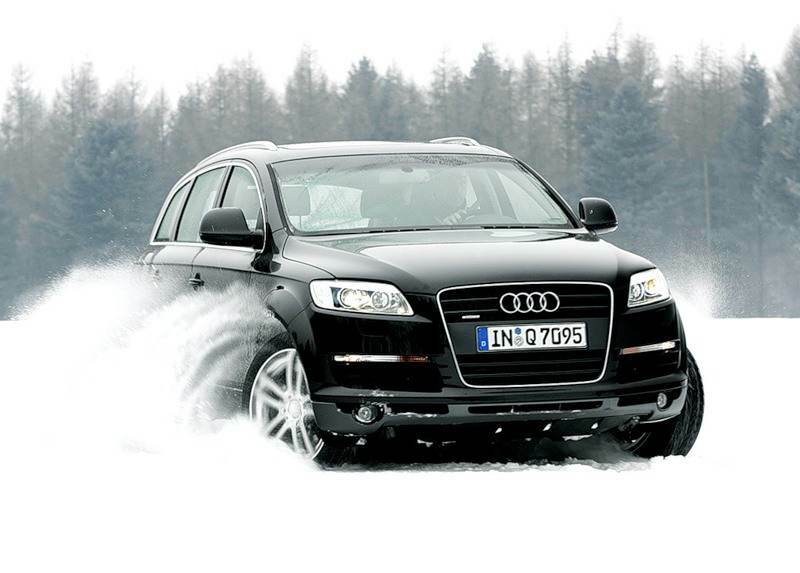 It has the same superb properties as above and will make your winter driving a lot safer. The biggest issue now falls to the 20″ wheel size. Winter tyres are not available in great numbers. Everyone, including the tyre manufactures, seem to have realised that dropping down sizes is the best way forward. Why is that the case? Well, the basic rule for winter is, put the least amount of tread on the road as possible. This enables the car to maintain grip by cutting through winter conditions, rather like we used to see Morris Minors do many years ago. If your Evoque has 17″ or 18″ wheels, opt for tyres only, it will probably cost you around £50 to £60 twice a year to have them swapped over, but worth it to keep your family safe and know that you won’t get stuck! In the 19″ and 20″ size, drop down to an 18″ package. These start around the £1000 area and are complete with the Alutec Grip or Poison wheels and Vredestein tyres. The wheel is TUV approved, meaning that the insurance companies don’t have an issue, and a five year paint guarantee and suit the car. It also has the benefit that if you are unlucky enough to clip a kerb, then you haven’t damaged a £500 Evoque wheel! In all sizes, winter tyres will make the Evoque perform so much better and when coupled with Land Rover’s superb 4X4 system, you’d never know the difference! Thanks for reading, if you have a view point or have winter tyres on your Evoque, leave a review below, we’ll answer any questions and comments. The Range Rover Sport, Just Not In Winter, Or Is It? In this post Winter Tyre Reviews are going to look at the superb Range Rover Sport and with our Partner, Tyremen, look at what’s great for winter driving. So what do we know, well, as with any Land Rover, the off road capabilities are second to none, when fitted with the right tyres. These days, they come fitted with low profile road tyres, which doesn’t make the Sport the best in snow, slush or icy conditions. As standard the Sport comes with either 275/40R20 or 285/35R22 wheels and tyres, great for holding the road in warmer conditions, but for winter, those wide tyres struggle to hold the road. So what is the way forward? Well, as any tyre expert will tell you, dropping down a size or two and fitting winter tyres will vastly enhance the performance of the Sport. The rubber compound of summer tyres becomes harder and less flexible at temperatures below 7C and makes the car lose grip and handling, after all, it is a heavy car. So what is the benefit of fitting winter tyres? Firstly, moving from a 275 or 285 tyre profile to a 255 enables less tyre tread on the road, like that on the Vredestein Wintrac 4 Xtreme which makes it easy to cut through the winter weather. The design of the tread pattern makes the evacuation of snow, slush and water very quick keeping contact with the road and reducing the risk of aquaplaning. A small rim size, such as the 19″ Blazer below, enables a taller tyre height giving a softer ride and the room for a flexible tread to maintain grip and handling. With the taller tyre, the smaller rim does not look out of place. But what if you would rather just get winter tyres rather than a package? Well, good news and bad news. If you have the 20″ wheels then tyres are available, just not in great quantities. Prices start at around £200 per tyre and manufactures are limited. Now the bad news, if you have 22″ wheels, then the chances of getting tyres is pretty much non-existent. If you can get some, a budget tyre starts at around £220, but as budget suggests, not great for winter. The premium brands, such as Pirelli, start at £330 and you can pay anything up to £450 per tyre. So what about the 19″ wheel and tyre package? If budget tyres are coming in at £880 a set, then surely its double? No, a package from Tyremen is around £1150. Why? As its a smaller wheel and tyre, therefore produced in greater numbers, costs are kept down. For us, it’s no contest, a winter package, protect your 20″ or 22″ OE wheels and a little scrape on the winters won’t be the end of the world. Already have a set? Leave a review below or let us know what you have done for winter and we’ll share with all our readers. Here at Winter Tyre Reviews we’re going to look at what’s available to keep your light commercial vehicle and motorhome safe on the roads this winter. With our partner Tyremen, we have found the top five winter tyres to review for small vans, larger vans and motorhomes. 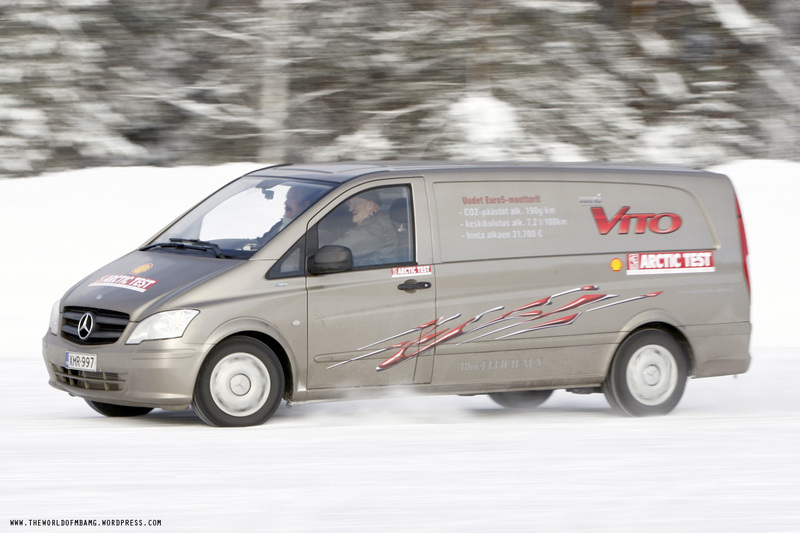 So we will start with the Vredestein Snowtrac Rein which is used on small vans such as the Nemo or Blipper. So what’s it like? A great little tyre ideally suited to small light vans when weight is an issue. It’s directional tread pattern is ideally suited to the quick clearance of snow, slush and water during the cold, damp months. The tread blocks allow superb bite into winter surfaces for excellent acceleration and keeps the tread free of snow. Giving increased grip and handling it gives the assurance of summer tyres during the warmer days. Braking is improved over standard tyres further increasing the safety of the driver and cargo! With a fuel rating of E, a wet grip of C and noise level at 70db, (explained here) it’s the perfect choice for winter. 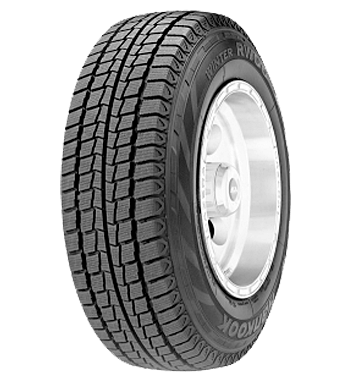 The Hankook RW06 is a mid-range, affordable winter tyre, specifically designed for a multitude of light commercial vehicles. A robust wide tread pattern gives maximum contact area with the road, vastly improving handling, traction and braking in snowy, icy and wet conditions. Manufactured with multiple sipes in the tread blocks, safe winter driving is assured. 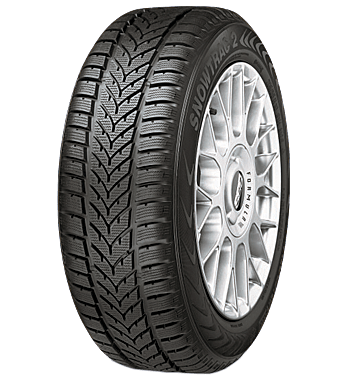 This tyre does not have studs within the tread pattern and relies solely on the rubber compound and tread design, which we feel, works very well. Fuel rating is F – G, Wet Grip E and Noise 73db. To give this tyre it’s full name, the Bridgestone Blizzak W800, a formidable looking tyre with some great properties. It comes in rim sizes 14″ to 16″ and is a non-directional tread pattern. Again, this is a tyre for the commercial market and has proved popular with drivers and fleet owners. A zig-zag sipe pattern within the tread blocks ensures great grip on acceleration, assured braking and all round handling properties. A durable and comfortable drive, helps maintain stability of the vehicle keeping driver and cargo safe. However, it rates badly for fuel usage, which a lot of winter tyres do, but this is the worst ratings. So, Fuel F to G, Wet Grip B to E (only one tyre rates E the rest are B or C) and Noise 72db to 74db. We are now going to look at multifunctional winter tyres for commercial vehicles and motorhomes. 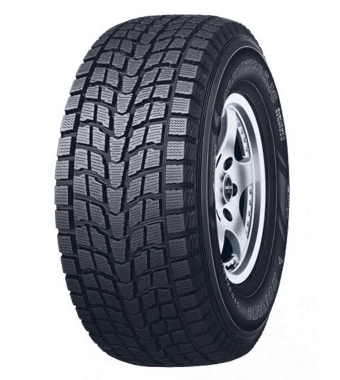 Vredestein are huge in Europe, and given that winters there can be far worse then in the UK, winter tyres are very popular. Surprisingly, a lot of people on the continent love to go away in their motorhomes during the winter. Ski resorts are very popular and winter tyres are a legal requirement, which is why we have these. A solid directional tread pattern with zig-zag sipes gives superb grip in all winter conditions and clears snow, slush and water quickly and effectively. Stopping distances are reduced compared to summer tyres and acceleration is assured and responsive. With a rubber compound designed to perform in colder conditions, this is the perfect multi-vehicle tyre for both commercial and motorhome. With Fuel ratings between E and F, Wet Grip of E and Noise at 71db it is probably one of the best available. Continental are a very popular premium brand, as you may have noticed from all the TV adverts during football games, and why not, do you get what you pay for? Well, yes and no. They make great tyres but are sometimes a little expensive. However, as one of the original suppliers of winter van tyres, they have led the way and this is why. A superb tread pattern with directional sipes gives an assured performance in colder conditions. Grip is constant and the tyre moves slush, snow and water from the tread quickly to ensure traction and braking is effective. It is a genuine winter tyre and its ratings are, Fuel E, Wet Grip C and Noise 73db. For more information on tyre ratings, click here. Have you used winter van tyres? Please leave a comment or ask a question below, we always respond! 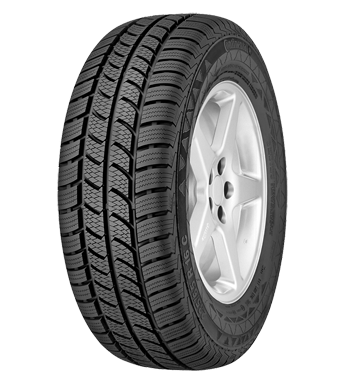 SUV and 4X4 Winter Tyres, Which are Best? Here at Winter Tyre Reviews, with our partner Tyremen we are going to look at the top three most popular winter tyres for SUV and 4X4 vehicles. So lets start with the Vredestein Wintrac 4 Xtreme. This tyre is gaining in popularity in the UK which mirrors sales in Europe. Designed with performance in mind, this is a robust SUV tyre with saloon car characteristics. A prominent ‘W’ directional design tread pattern gives a robust appearance which is demanded by owners, but just because it looks good, is it? Well, the tread design makes the clearance of water, slush and snow a quick and effective process. Stopping distances are good when compared to summer tyres and handling improved for greater stability in cold weather. Tyre wear is good and we have had reports comparing mileage with summer tyres. Basic off road use is good, enabling great traction in mud and gravel tracks and driveways. Fuel economy is rated between C and E dependant on size, Wet Grip is rated E and noise levels at 71db see here for a full explanation. All in all, a great choice for winter safety giving confidence for all day to day use! 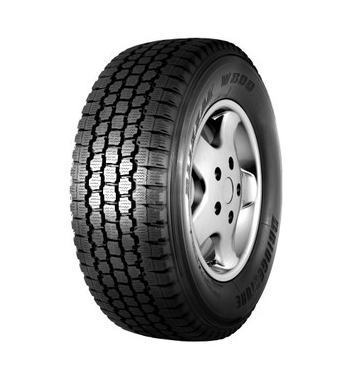 As you can see from the image, the Goodyear is a traditional SUV/4X4 tyre, big, chunky with a defined tread pattern, so can you use it for normal every day use? Well, yes you can, and here’s why. As it’s name suggests, the Ultragrip does just that! It gives exceptional traction and pull in most winter conditions. Unlike the Vredestein, this is a tyre designed with ‘off road’ in mind, but that then balances off against ‘on road’ qualities. Fuel economy is E to F ,Wet grip is C to E, Noise levels between 68db to 75db. Wow, just look at that tread pattern! Six wide circumferential grooves provide one of the best water drainage tyres around and helps to reduce the risk of aquaplaning in some of the worst conditions. It is designed with multiple blades and its compound is made up with Silica-Plus and microscopic studs which gives superb traction and wet performance. The tread pattern is directional, with wide grooves that cuts through water, slush and snow. Dry weather grip is good on the majority of surfaces with a firm grip on ice. Fuel economy is rated at E, Wet Grip is rated at F and noise levels at 74db to 76db dependant on tyre size. 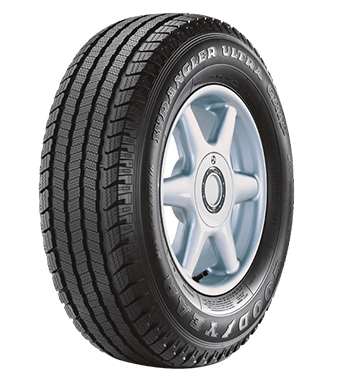 There are other SUV tyres out there, but as they come in large sizes and don’t make up the biggest percentage of cars on the road, they can be hard to come by. Thanks for reading and leave your thoughts or comments below.